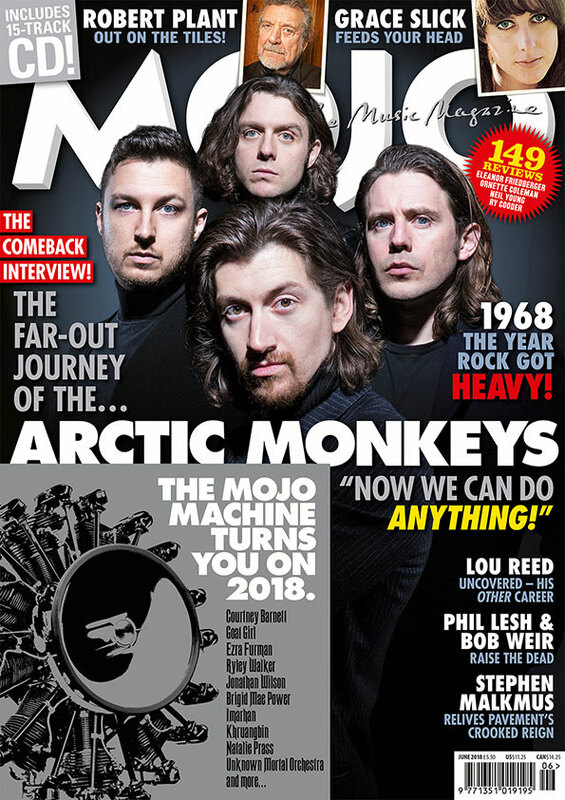 FIVE YEARS ON from the blockbusting AM, MOJO takes an exclusive and revelatory trip with Alex Turner and the Arctic Monkeys, as they prepare to unveil their cosmic sonic makeover. “Now,” they tell us, “we can do anything!” Also in this issue: Robert Plant keeps Led Zeppelin in check, Grace Slick remembers the highest of times, Stephen Malkmus considers Pavement’s crooked reign, and Ryley Walker takes a dip in Chicago’s wild side. We uncover Lou Reed’s hiatus from rock, select the Jacksons’ most thrilling albums, spend quality time with Phil Lesh & Bob Weir, John Prine, Shabaka Hutchings, Eleanor Friedberger, Bettye Lavette, Wire, Rhiannon Giddens and The Move, and solve – finally! – Le Mystère Des Voix Bulgares. Plus: The MOJO Machine Turns You On 2018, a covermounted CD filled with our favourite new music of the year thus far, starring Courtney Barnett, Ezra Furman, Jonathan Wilson and many more. Feed your heads! COVER STORY: ARCTIC MONKEYS From Sheffield to… space? Alex Turner & Co. celebrate a decade as Britain’s top band with a bold new album exploring exciting new territory. “There’ll be fans that will be a bit confused now,” they tell Danny Eccleston. COVERMOUNT CD: THE MOJO MACHINE TURNS YOU ON 2018. 15 of our favourite new tracks of the year thus far. Starring Courtney Barnett, Ezra Furman, Jonathan Wilson, Unknown Mortal Orchestra, Goat Girl, Natalie Prass and more. STEVE MALKMUS One of ’90s rock’s originals, the Pavement man trucks on, trying to not be “self-conscious or afraid”. He talks *Dragnet and Christian rock with John Mulvey. GRACE SLICK Jefferson Airplane’s psychedelic siren on bedding the band and booting the booze, the music that soared and the records that stank. Warning: contains fun. RYLEY WALKER Guitar music’s tortured explorer takes us on a tour of his Chicago manor and its improv scene, if he can put the drugs aside long enough to talk sense to Andrew Male. 1968: THE BIRTH OF HEAVY Jon Savage selects 12 recordings that reflected a key year of turmoil in big, dark riffs and bludgeoning drums. Cream, Blue Cheer, Iron Butterfly stomp on. PLUS When Lou Reed renounced rock’n’roll / John Prine’s “third wind” / How To Buy The Jacksons / Rhiannon Giddens on her Cambridge Folk Festival picks / Mélissa Laveaux’s creole pop mission / Inside Bill Nelson’s crazy lair / Bettye Lavette hymns Etta James / Bob Weir & Phil Lesh raise the Dead / Cocteau Twins’ Elizabeth Fraser helps solve Le Mystère Des Voix Bulgares / Graham Coxon’s Mindblowers / First Aid Kit portray themselves / Bye bye Mickey Foote / All Back to Bill Wyman’s! SAVE MONEY ON MOJO MAGAZINE HERE!